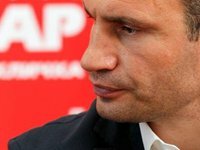 Leader of the UDAR Party Vitaliy Klitschko has said that the only way for the opposition to win the 2015 presidential election will be to nominate a single candidate. "Last night, I went to the tents (of pro-European protesters on Independence Square in Kyiv), greeted people, talked to them. Everybody says they are not going to give up. And everyone is talking about a complete change of government and asking whether the opposition is able to put forward a single candidate," the UDAR party's press service quoted him as saying on Tuesday. "The democratic forces must nominate and support a single candidate in the presidential election. I said this a long time and I have not changed my opinion. How can we speak of a single team, when there will be several candidates? Don't the authorities currently need to scatter the votes to arrange a brutal surprise and in the runoff?" Klitschko said. As reported, on January 5, Head of the Batkivschyna opposition faction Arseniy Yatseniuk said that the leaders of all three opposition political forces would run in the first round of Ukraine's next presidential election. Such a decision was made in May 2013, he said. "As far as our single candidate is concerned, we have already held several rounds of negotiations and have officially announced their results because on May 18 last year our three political forces signed an agreement in which they pledged to rally around a single candidate in the second round. This agreement was signed and it must be implemented. The agreement says very clearly that the first round will serve as primaries for all the candidates, and a candidate who scores the best result [in the first round] will receive the support of all the opposition forces during the second round," Yatseniuk said. "Nothing has changed officially at this stage," he added.